This post and living room design makeover is sponsored by Safavieh. All opinions are my own. Full disclosure, I am not an interior designer. I do not claim to know everything (or much at all) about home design. But when we left Boston, I knew one thing for sure – it was time for me to try. See, the majority of the furniture in my home were super old and outdated. Most of the pieces were super low-cost items I’d collected over the years on one of the many places I’ve lived. Moving back to Cali (and hopefully the last big move), I knew I wanted to get new, quality pieces. I knew I was up for the challenge to create a living room design I would love. When my friends at Safavieh agreed to help furnish my living room, I was beyond thrilled. They have so many gorgeous and unique pieces. I couldn’t wait to get started. To start, I knew I wanted to skew mid-century modern. Choosing a design aesthetic is a great way to start your design process. I really like mid century modern because it feels clean and timeless, but still does have a modern vibe. Another reason I chose mid-century is because it actually goes very well with the style of my patio home. We have a wood brick fire place that feels very mid-century, as does the front of our home. I specifically chose several of the pieces because they do feel mid-century. 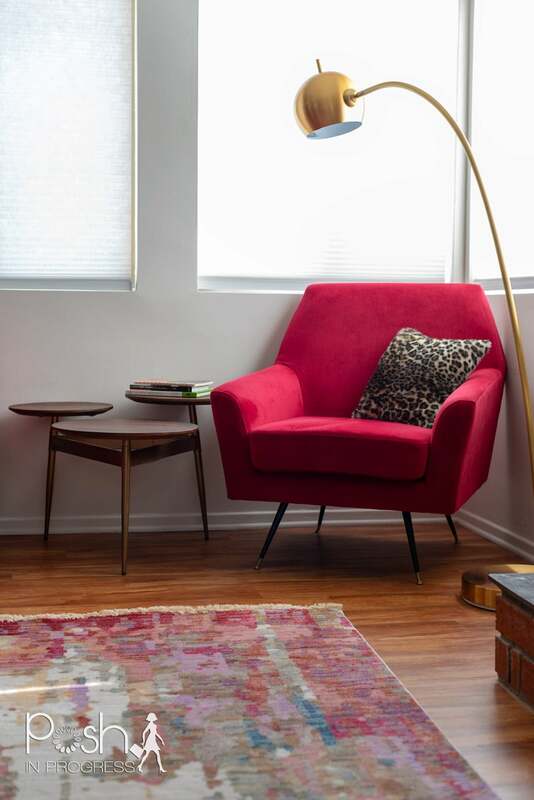 For example, the chair and the chest I chose are definitely mid-century, as are the floor lamp and the table lamp. There is no question of their design aesthetic, so these unique pieces definitely set the stage for the rest of the space. Although I chose the specific pieces because their shapes and design felt mid-century. I also chose them based on their color, wood and metal details. 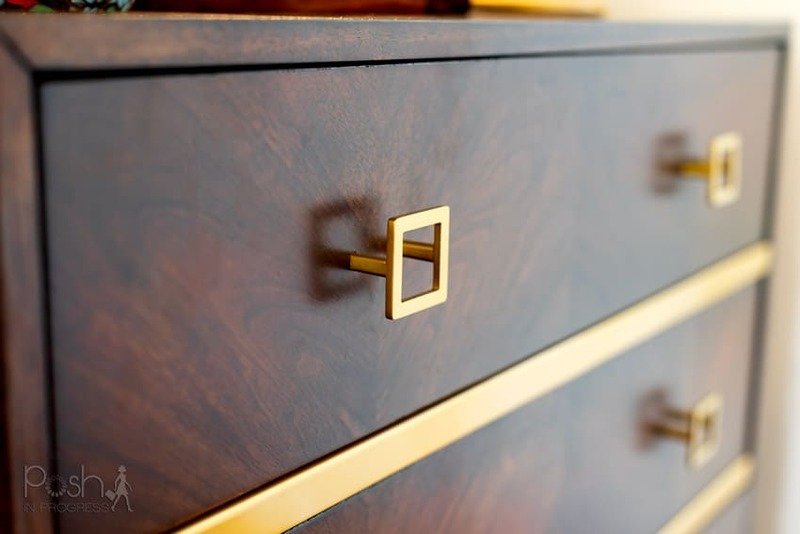 The chest really stood out to me as a piece I needed in my home because of the gorgeous wood grain and the special square detail drawer pulls in shiny gold. Once I decided on gold/metallic accents and a darker-grain wood, I also chose this accent table. It also feels somewhere between mid-century and industrial. We have some other industrial pieces in my home, so together they work. The wood on the accent table also closely matches the chest, so they really compliment each other. 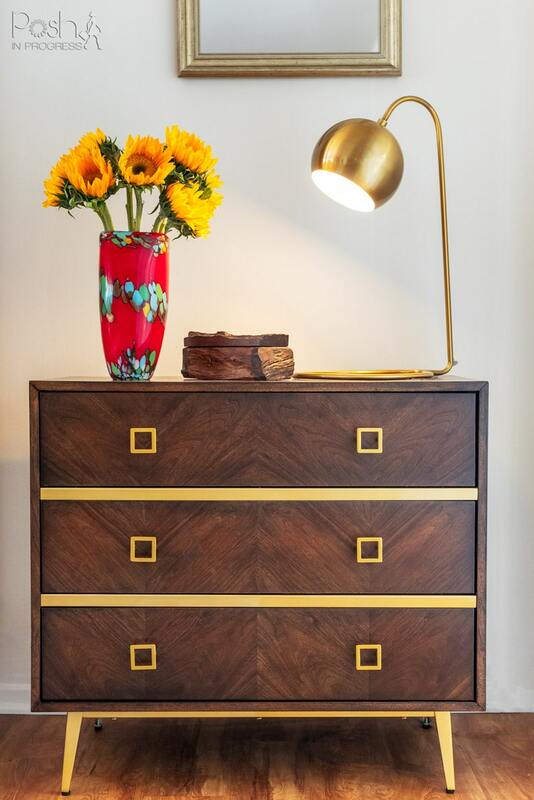 Besides the gold/metallic accents and the darker wood, I also opted for a few pops of color. Specifically, I chose a vibrant red accent chair. Since our couch is charcoal grey velvet, I wanted a bright color to set off the room. Our floors are a medium, almost honey-colored warm wood, so I knew red would look fantastic. I’m also in love with the color red, so an accent chair felt like the perfect way to bring in one of my favorite colors. The chairs also have tiny little gold feet. Although it’s a tiny detail, I like that the gold carries from the table, chest, lamps, and chair. 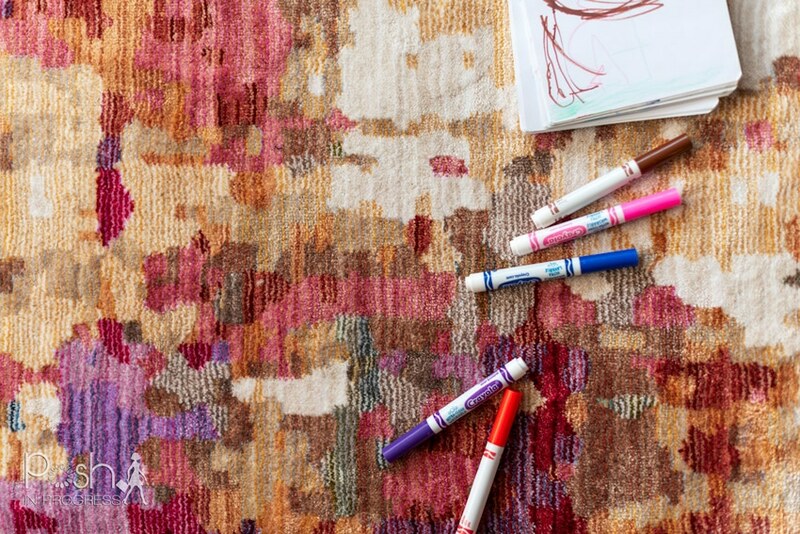 For me, the thing that ties the entire room together is the gorgeous multi-colored rug I selected. Safavieh is really known for their rugs, and now I understand why. As I was scrolling through all of their rug options, I was a little overwhelmed with the amount to choose from. But, as soon as I saw my rug, I knew it was the one. I loved that it had vibrant reds and purples in it, but was equally excited to see some blues and beiges. It feels modern, but also really blends into the background. 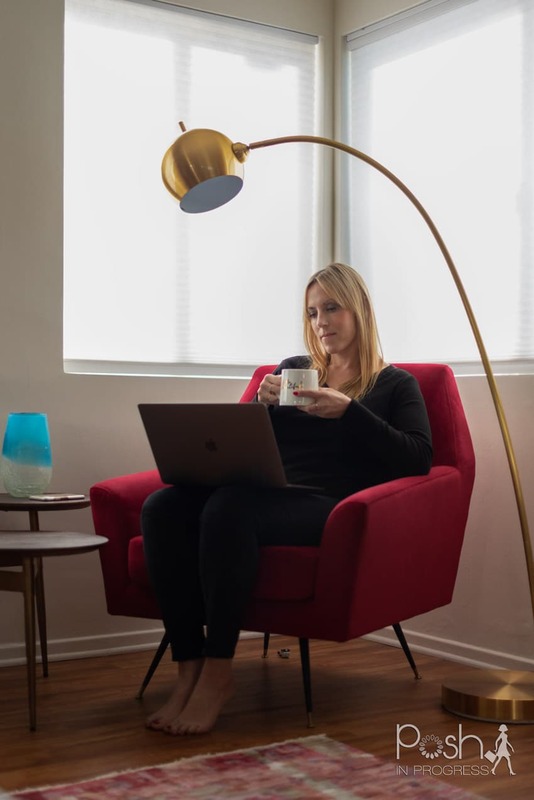 Since my floors are wood, and the couch is grey, it doesn’t feel like too much color – it actually just really brightens up the space. I’m beyond thrilled with how my living room design turned out. I’m in love with all of the Savafieh pieces I chose. When I walk into my home, I finally feel at home. The pieces speak to who I am, what I like, and that makes me feel so good. This is the first time, ever, that I made a concerted effort to create a space that really reflected my tastes. It’s pretty amazing how different my home feels now that I took the time to actually come up with a living room design that reflects my tastes. I’m so happy I finally did.